The MetSENS550 compact weather sensor measures wind speed and direction via an ultrasonic sensor, as well as air temperature, relative humidity, and barometric pressure, in a single, combined instrument mounted inside three double-louvered, naturally aspirated radiation shields with no moving parts. An integrated side connector allows users to connect a tipping bucket rain gauge. An integrated electronic compass provides apparent wind measurements. WMO average wind speed and direction and gust, temperature, relative humidity, barometric pressure, absolute humidity, air density, wet bulb temperature, rainfall total, and rainfall intensity data are provided. The MetSENS550 is compatible and easily integrated with the MeteoPV Solar Resource Platform and any Campbell Scientific data logger using SDI-12, RS-485, ModbusRS-485, or NMEA RS-232. MetSENS has a compass module that outputs at 1 Hz real time without affecting any other measurements, which allows the correction of wind direction if the station is installed on moving ice. MetSENS has a two-year service life, which is especially helped by the use of a double-louvered radiation shield to reduce the flow of contaminants getting to the temperature/humidity probe. MetSENS has an option for GPS. MetSENS has a wind speed resolution of 0.01 m/s, whereas most all-weather sensors have a resolution of 0.1 m/s. MetSENS has a dew point accuracy of ± 0.3°C, whereas most all-weather sensors have an accuracy of > ±0.7°C. MetSENS temperature resolution is for the full-range temperature at 0.1°C, whereas other all-weather sensors change to 0.2° at the extremes. MetSENS offers users the option to use any industry-standard tipping bucket rain gage (MetSENS550). MetSENS provides RS-232, RS-422, RS-485, Modbus, and SDI-12 from all models. MetSENS uses Intelligent Signal Processing (ISP) and Adaptive Gain Control (AGC), which have been proven worldwide to provide good quality data. 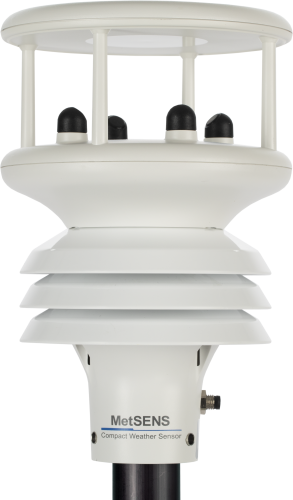 MetSENS does not indicate a drop in wind speed if the temperature drops or if rain occurs, whereas this is fairly common in other all-weather sensors.